*This gluten free dining experience took place in June 2018. 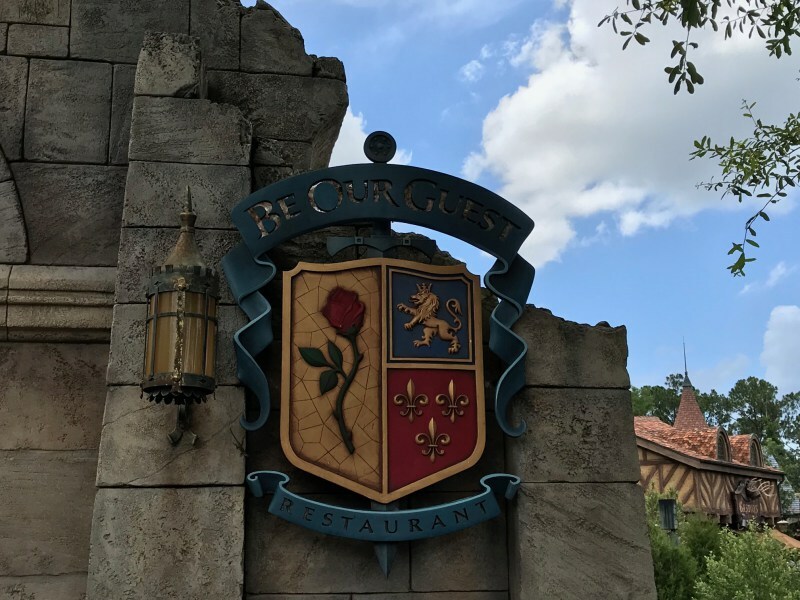 Be Our Guest Restaurant is a restaurant in Fantasyland in the Magic Kingdom that serves both quick service breakfast and lunch and table service dinner. I haven’t eaten lunch at Be Our Guest Restaurant since 2013, so it’s been a very very long time. Recently, we asked you, the readers, what quick service restaurant we should eat lunch or dinner at, and Be Our Guest was the most requested. So, given how long it had been and your requests, we had to go! Brandon has also never eaten at Be Our Guest for any meal, so he was looking forward to checking it out too. When it comes to a well-themed restaurant, Be Our Guest is definitely one of the best. From the moment you arrive, you’ll feel like you’re transported to the Beast’s Castle with Belle. If you do have the time, I highly recommend taking a moment to look around at the exterior of the restaurant. There’s so many beautiful touches and great photo opportunities.